Switzerland typically does things on a grand scale – the craggy bulk of the Matterhorn, the glossy prestige of Geneva, the epic ski slopes of Graubünden – so for the modestly proportioned Bern to be its capital can seem incongruous. What this likeable little city lacks in headline-grabbing majesty, however, it more than makes up for in charm. 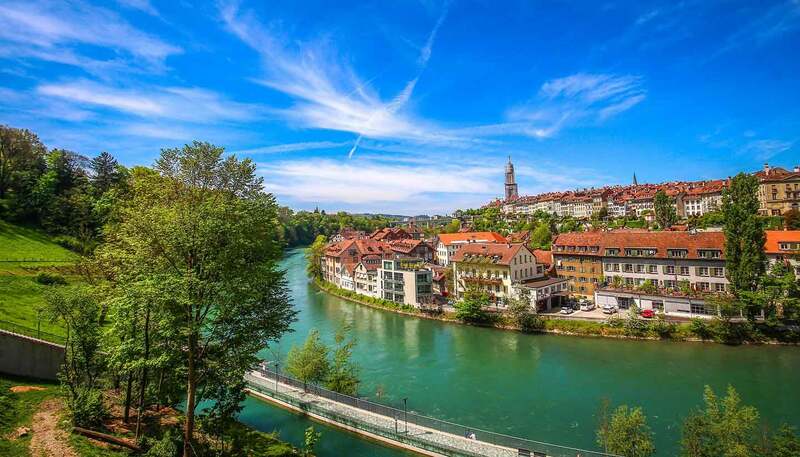 Set on a crook in the River Aare, it's a place where history looms large, with a UNESCO-listed old town, medieval clock tower and gargantuan cathedral all lending the place a stuck-in-time feel. It also has a strange fascination with all things ursine – the name 'Bern' is said to have derived from when the city's founder killed a bear here on the Aare peninsula, and there have been bear pits in the city ever since. Visitors can still see the resident bears living freely, climbing, fishing and playing by the river in Bern's Bear Park. Another, equally unique tourist opportunity, is for strong swimmers to join the locals in drifting along the river, passing superb views of the city's architectural riches along the way, including the Houses of Parliament. Back on land, the many high-quality restaurants, bars and wine cellars are as varied as the city's excellent museums, which range from the grandiose Bern Historical Museum to the quaint Einsteinhaus, a flat that was once home to the city's most famous resident: Albert Einstein. You may well need Einstein's mathematical expertise when it comes to shopping, because Bern isn't cheap – expect fine jewellers, premium chocolatiers and exclusive designer boutiques. Browsing the 6km (3.7 miles) of 15th-century arcades in the Old Town, though, is a delight. Another unique characteristic of Bern is its fountains; there are over 100 of them. Each tells a story about events and heroes in the city's past. The most gruesome – and consequently the most famous – is the Kindlifresserbrunnen located on Kornhausplatz, which depicts an ogre swallowing a child. Bern even has its own mountain, the Gurten, popular with locals and visitors in the summer thanks to its sweeping views, miniature railway and observation tower. Sleek towers and financial clout? Overrated. Bern has something far harder to buy: charm.